The Ohio Valley Conference Baseball Runners -up and Eastern Division Champions. 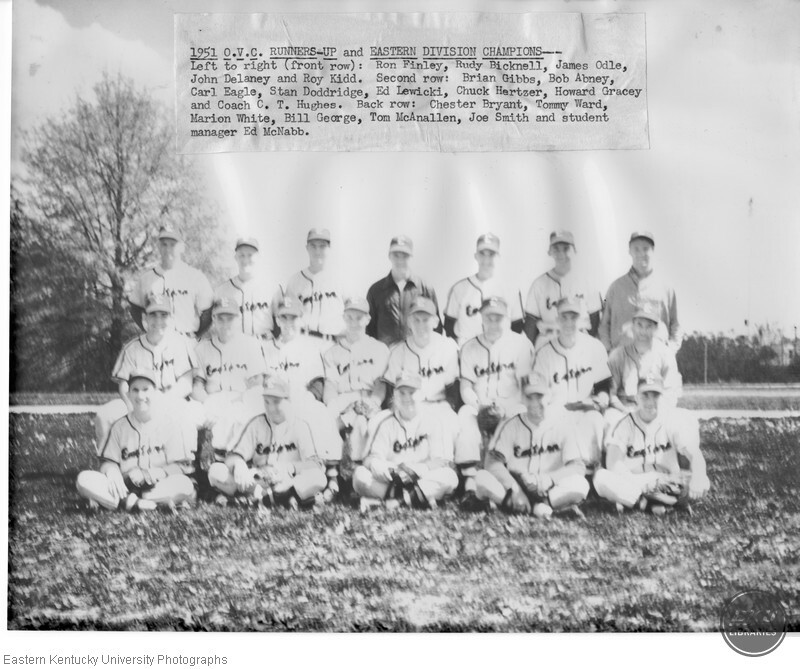 Left to right (first row): Ron Finley, Rudy Bicknell, James Odle, John Delaney, Roy Kidd; (middle row): Brian Gibbs, Bob Abney, Carl Eagle, Stan Doddridge, Ed Lewicki, Chuck Hartzer, Howard Gracey and Coach Charles "Turkey" Hughes; (back row): Chester Bryant, Tommy Ward, Marion White, Bill George, Tom McAnallen, Joe Smith, Ed McNabb (student manager). “The Ohio Valley Conference Baseball Runners -up and Eastern Division Champions. ,” Digital Collections, accessed April 25, 2019, https://digitalcollections.eku.edu/items/show/33277.